We’re pleased to announce the addition of two more years to the ever-expanding Linus Pauling Day-by-Day project. 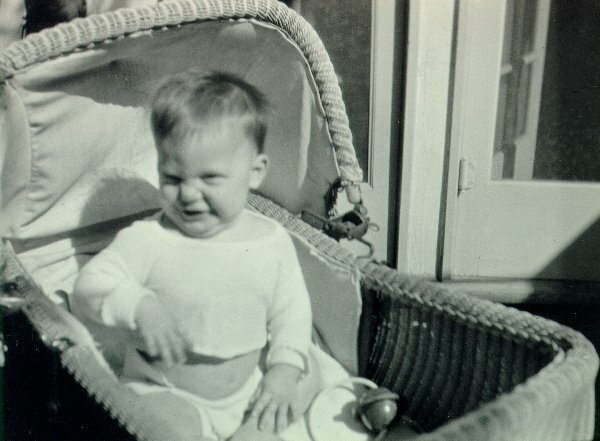 Now in its fifteenth year of production and growth, the website seeks to document as many days of Linus and Ava Helen Pauling’s lives as possible – painstaking work that has been carefully mined, by a cast of hundreds, from our holdings in the Pauling Papers. With this latest release, the project now covers four full decades, from 1930-1969. The new years in question are 1968 and 1969 – awkward years for the Paulings and difficult ones for the world at large. 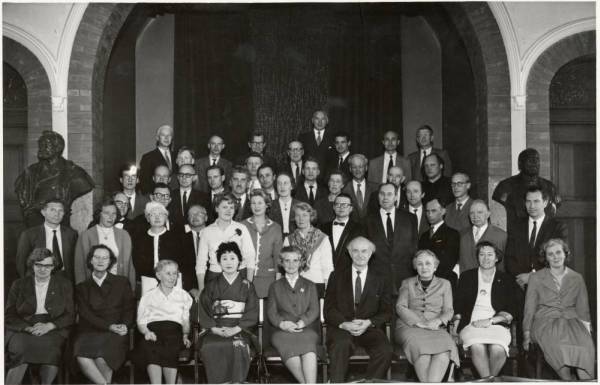 While the war in Vietnam escalated, activism in the streets turned violent and cultural shifts accelerated, the Paulings found themselves well within the nomadic period that had defined their lives ever since Linus Pauling’s departure from Caltech in Fall 1963. Prior to arriving at some measure of stability at Stanford University, where he began setting up a small laboratory in the summer of 1969, Pauling had bounced from the Center for the Study of Democratic Institutions to the University of California, San Diego, never with fully satisfactory results. Partly because of the uncertainties surrounding his institutional affiliation, Pauling found it increasingly difficult to attract the sort of research funding to which he had been accustomed during his glorious run in Pasadena. The situation deteriorated to the point where he was compelled to appeal to a private source for support: his ex-daughter in law. Anita Oser, an heiress to the Rockefeller and McCormick fortunes and, by 1968, long since divorced from Linus Pauling Jr., had provided funding for Linus Sr.’s work in the past. 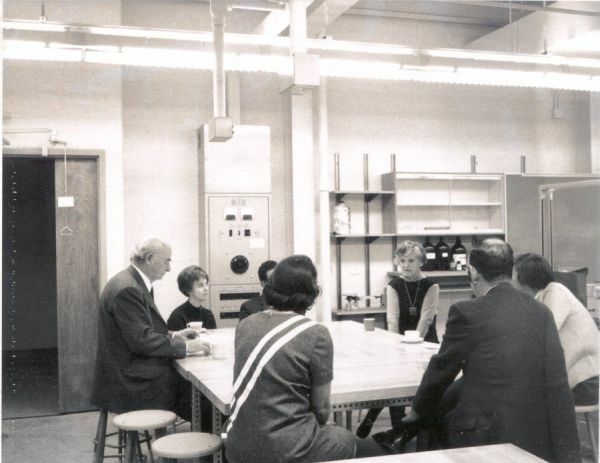 By Spring 1968, the elder Pauling’s financial footing had deteriorated to the point where he was asking Anita for nearly half of the estimated $100,000 that he needed to keep his program afloat. Fortunately the other half had already been pledged by Chester Carlson, a founder of Xerox and a former student of Pauling’s. The gloom that surrounded Pauling’s professional concern permeated other aspects of his and Ava Helen’s lives. Both Linus and Ava acknowledged that La Jolla, where the Paulings lived while based at UCSD, was not to Mrs. Pauling’s liking, (“I have felt uprooted and purposeless here,” she wrote to her son, Peter) and it was a welcome turn of events indeed when the couple purchased a new home in Portola Valley, California, not far from the Stanford campus, once the move north had been finalized. Of far greater consequence though, was the tumult that defined world events during the time period. On multiple occasions, the Paulings reveal themselves in their correspondence to be burdened by the pressures of the day: “we are going through a terrible time,” Pauling admits in a letter to Prof. Carroll Richardson; “The times are horrible here in the U.S. and I’m sure they will get much worse…one could cry,” Ava Helen lamented, again to her son Peter. I agree with the statement in your letter that some of the university students fail to act in accordance with my statement that we must bring law and order into the world as a whole. I do not think that their actions have been nearly so violent and basically unlawful as those of their elders. The war in Vietnam and the institution of the draft for the military service are probably the most significant reasons for the present student unrest. I myself feel strongly that a young man who does not want to kill any of his fellowmen should not be forced by the government to do so. I estimate the ratio of the violence done by the government to that done by the revolting students as about one million to one. We are trying to stop the REVOLUTION of the miserably poor, the starving, the economically exploited people of the world, by use of our military might…. I have confidence in you young people, who are revolting against the greed, the hypocrisy, the immorality of your elders…. Pauling’s first love was forever science and scientific inquiry surely did not disappear during this time. While work continued on more abstract investigations into structural chemistry and molecular architecture, the defining publication of this period was “Orthomolecular Psychiatry,” Pauling’s theory that optimum mental health is dependent upon achieving an ideal chemical balance within the body – a balance attained through nutrition and nutritional supplementation. The paper, which was published in Science in April 1968, generated a great deal of discussion and, for Pauling, a large volume of mail. So it is that we are able to tease out interesting subcomponents and offshoots of the theory: the possibility that niacin may help to control anxiety; the potential for treatment of brain damage through nutrition; the likelihood that criminal activity is caused by a “diseased or injured brain.” It was not much longer before Pauling became more fully infatuated with the idea of orthomolecular medicine and launched head on into his crusade in favor of vitamin C.
Thanksgiving Day photo used in a Kamb family greeting card. From left are Linda Pauling Kamb, with Ava Helen and Linus Pauling, and Linda’s four boys. Linus Pauling Day-by-Day presently consists of over 118,000 document summaries, nearly 2,300 scanned documents and over 3,000 full-text transcripts. The larger themes of Pauling’s life are, of course, easily traced within the resource. But the project has also allowed us to play a little bit, posting notice of lesser known items from the collection: Pauling’s favorite book as a child; a patient reply to the concept of a “love bomb“; thoughts on alternatives to shaving. It’s these little nuggets that bring a smile to our face and help to keep us energized as we continue to move forward with the project. We’re glad to make it available to our users, whatever their research interest may be. 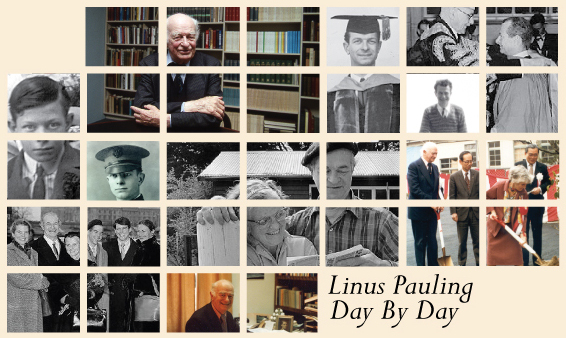 We are pleased to announce the release of five new years of the Linus Pauling Day-by-Day project, which attempts to document every day of Pauling’s life. With this release, thirty-seven years of Pauling’s activities, interactions and travels have been meticulously recorded in our online calendar, a mammoth resource now featuring an amazing 188,027 activity listings and supplemented with 2,299 scanned documents and 2,942 full-text transcripts. The transcripts include family letters as well as selected documents (mostly correspondence) used as illustrations for the Day-by-Day project and for the various Pauling Documentary Histories. As with the first Nobel year, 1954, we have attempted to provide an illustration for every day of 1963, while other years receive an illustration for every week. Our most recent addition is comprised of the years 1963-1967, a particularly tumultuous time for Pauling. In 1963 Pauling received the Nobel Peace Prize for his work in petitioning against the testing of nuclear weapons. Internationally, Pauling was celebrated for his activism, while at home in the United States he was attacked by for his leftist politics – a phenomenon that, in part, led to his move from the California Institute of Technology to the Center for the Study of Democratic Institutions. The tumult of the era also led to his participation in several libel lawsuits filed against an array of American media outlets. Pauling did not, however, allow the trouble at home to distract him from his activism. Instead, he used the fame afforded by the Peace Prize to draw attention to the question of nuclear disarmament. He traveled extensively through North America, Scandinavia, Western Europe, Australia, Latin America and India, lecturing on the need to achieve global nuclear disarmament and lasting peace, and cementing his relationships with fellow peace activists. In the years following his receipt of the Peace Prize, Pauling returned to theoretical chemistry and, in 1965, he announced his close-packed-spheron theory of the structure of atomic nuclei. In the mid-1960s he also collaborated with Emile Zuckerkandl on a study of proteins as records of molecular evolution, published a revised and abridged edition of The Nature of the Chemical Bond, and continued serving as an informal bridge between the general public and the scientific community. While naturally documenting the important moments in Pauling’s life, the Day-by-Day calendar also serves as a window into Pauling as a person – one which documents the strain of conflicting political pressures, the effects of age on him and his wife, and his ever-exacting personality. Begun in 1999, Linus Pauling Day-by-Day is an ongoing project with work on 1968-1970 already well underway. For a detailed look at past milestones as well as the technical mechanics of this ambitious undertaking, please see our series of past writings on the project. We recently completed and uploaded two more years of the ever-expanding Linus Pauling Day-by-Day project. With the addition of 1961 and 1962, more than three decades of Linus and Ava Helen Pauling’s lives are now chronicled in exquisite detail. The mammoth site currently includes summaries of over 92,000 documents and features 1,851 illustrations and 2,289 full-text transcripts. The years 1961 and 1962 bore witness to the Paulings’ continuing tilt away from scientific research in favor of a pitched agenda of peace activism. Both were likewise incredibly busy years littered with international travel, worldwide acclaim and periods of heavy tumult. The energy that the Paulings expended over this period of time surely took its toll – in their letters to colleagues, both Linus and Ava Helen commonly remark of being overwhelmed with work and on the brink of exhaustion. Their labors did not go unnoticed, however, and their frenzy of activity in 1961 and 1962 surely added to the dossier for which Linus Pauling would receive the Nobel Peace Prize in 1963. Many of the Paulings efforts during these years have been chronicled on this blog or on our Documentary History sites. 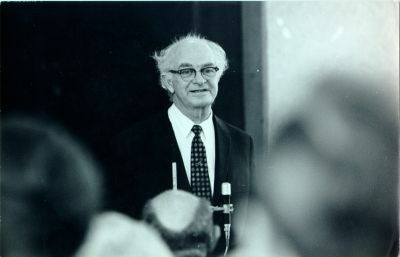 Among them, in 1961 Linus Pauling published his theory of anesthesia, worked with Ava Helen in organizing the Oslo Conference against nuclear testing, and continued to dialogue with both John F. Kennedy and Nikita Khrushchev about matters of nuclear weapons policy. The next year saw more of the same, including the famous “White House incident,” many more awards (including an honorary high school diploma) and nearly 2,700 unsolicited write-in votes for U. S. Senator from California. In the midst of it all, the Paulings traveled almost non-stop, from Toronto to Honolulu, Paris to Cleveland, Moscow, Chile, Dallas and many points in between. Linus Pauling Day-by-Day documents this blizzard of activity while simultaneously attempting to shed light on some of the lesser-known components of the Paulings’ personal and professional matters. Indeed, one of the true delights of working in an archive of such breadth as the Pauling Papers is the opportunity to uncover and make available documents of a more esoteric nature. And so it is that we find Pauling hazarding a guess in response to a question about birds losing their sense of direction when flying through a radar area. Likewise, readers may be interested in a short discussion about a treatment for catatonic schizophrenia, his notes on Albert Einstein’s belief in God, and his gratitude upon receiving a particularly thoughtful birthday gift. The illustrations selected for the Day-by-Day project are full of such nuggets. Work is completed on the Day-by-Day project on a nearly continuous basis here in the OSU Libraries Special Collections. The data for 1963 and 1964 is close to complete and should be launched sometime later this year, with plenty more to come shortly thereafter. For those interested in the background and technical mechanics of this ambitious effort, see this series of blog posts published in 2009. 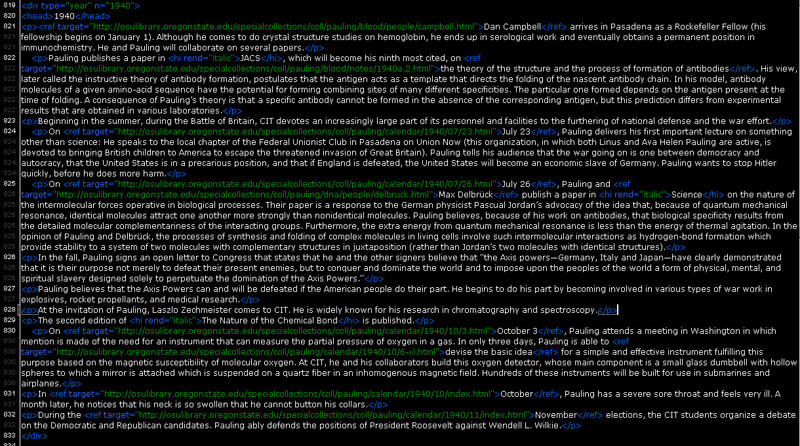 In our last post we discussed the four XML pieces that form the content of Linus Pauling Day-by-Day. Once properly formatted, these disparate elements are then combined into a cohesive, web-ready whole using a set of rules called Extensible Stylesheet Language Transformations (XSLT). This post will delve more deeply into XSLT and how we use it on the Linus Pauling Day-by-Day site. A single XSLT file controls the majority of the actions and templates that make up Linus Pauling Day-by-Day. Several Windows batch files, one for each year in the Calendar, control the calling of the calendar stylesheet with the calendar year XML. After some initial processing, the stylesheet begins to output all of the various pages. First, the main Calendar Homepage is created. This can be redundant when processing multiple years in a row, but ensures that the statistics and links are always up-to-date. Second, the Year Page is created. This pulls in extra data from the Pauling Chronology TEI file, specific to the year, displays a summary of the Paulings’ travel for that year, provides a snapshot image for the year, and lastly presents the activities for the year that don’t have a more specific date. An additional page is created that provides a larger image and some metadata for the snapshot document. Then, acting on the months present in the data file, a Month Page is created. This presents the first calendar grid (how this is done is explained in the next section) followed by all of the days in that month that have activities and document data. If there is data about where the Paulings traveled, that is displayed in the calendar grid to give a visual overview of their itineraries. Finally, a Day Page is created for each day present within a month. The stylesheet simply acts on the days listed in the calendar XML file, and does not try to figure out how many days are in a given month in a given year. This style of acting on the data provided, instead of always doing things to a certain size or range, is a part of the programming paradigm of functional programming. The Day Page features a large thumbnail of a document or photo, a smaller calendar grid, with travel information for the day displayed below if present, and then the activities and documents for that day. Another page is then created with larger images of the document, additional pages if present, and some metadata about the document. As most of the output pages have a similar look and feel, there is a set of templates that handle the calendar navigation menu. Depending on what context the navigation is needed for (Year Page, Month Page, etc. ), the output can adjust accordingly. An important part of the look and feel of the project from early in the planning stage was to have familiar and user-friendly navigation for the large site, which meant that the traditional calendar grid would play a big role. However, the data that we’ve amassed at the day level doesn’t have any information like the day of the week. Beyond the 7 days of the week that January 1 could fall on, the grids for each month are complicated by whether or not a year is a leap year, resulting in 14 combinations that don’t occur in a regular pattern. If you’ve ever looked at a perpetual calendar, you’ll know that the grids are deceptive in how simple they look. An initial design goal was to have the calendar stylesheet be able to handle all of the grid variations with only minimal help. We didn’t really want to have to prepare and store lots of information for each month of each year that the project would encompass. For each year, all the stylesheet needs is the day of the week that January 1 falls on (a number 1-7, representing Sunday-Saturday in our case), which is stored in the year XML, and then it can take that and the year and figure out all of the month grids. Fitting the algorithm for this into the XSLT stylesheet code is one of the more complex coding projects we’ve worked on. It took several hundred lines of code, but we haven’t needed to mess with it since it was first written, even as we’ve added years and expanded the project. With the help of new features in XSLT version 2 and several more years of experience, the code could be rewritten to be cleaner and more efficient. However, because it was so reliable, time on stylesheet development was spent elsewhere. In the calendar XML data, each day can contain a basic <travel> element that states where the Paulings were on that day. This information is gleaned mostly from travel itineraries and speaking engagements, but also from correspondence or manuscript notes, and usually represents a city. On the Year page, we wanted to present a nice summary for the year of where the Paulings traveled to, and how long their trips were. Because the data was spread across days, and not already grouped together, it was a challenge at first to get trip totals that were always accurate and grouped appropriately. Using the new grouping features in XSLT version 2, the various trips could be grouped together appropriately, and then displayed in order. A range could be computed using the first and last entry of the group, and linked to the day page for the first entry. Now if you see an interesting place that the Paulings visited, you can go directly to the first day they were there, and see what they were doing that day. If more than one day was spent in a given place, a total is displayed showing how many days they were there. The last post covered what METS records are and how we are using them. Because the files are fairly complex and have additional data that we aren’t using, the calendar stylesheet abstracts away the unneeded info and complexity. A temporary data structure is used to store the data needed, and then the calendar stylesheet refers to that in its templates, instead of dealing directly with the METS record and the descriptive MODS metadata. This approach is also used in the stylesheets for our Documentary History websites, and portions of the code were able to be repurposed for the calendar stylesheet. As covered in the last post, the transcripts are stored in individual TEI Lite XML files. In our calendar year XML data, a simple <transcript> element added to a listing conveys the ID of the transcript file. The stylesheet can then take this ID, retrieve the file, apply the formatting templates, and output the result to the HTML pages. We use XML Namespaces to keep the type of source documents separate, and then the XSLT stylesheet can apply formatting to only a specific one. So, if we wanted to apply some styling to the title element, we could make sure that it was only the title element from a TEI file, not from a METS file. This allows us to have a group of formatting templates for TEI Lite files in a separate XSLT file, which can be imported by the calendar stylesheet, and none of it’s rules and templates will affect anything but the TEI Lite files. Since the code for the TEI Lite files and transcripts was already written for earlier projects, very little stylesheet code (less than 10 lines) was needed to add the ability to display nice, formatted transcripts. 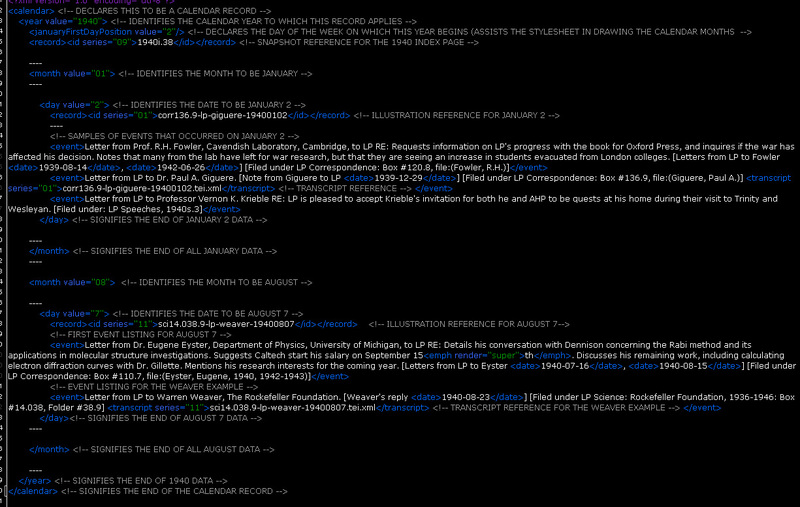 Any given page in the Linus Pauling Day-by-Day calendar is the product of up to four different XML records. These records describe the various bits of data that comprise the project – be they document summaries, images or full-text transcripts. The data contained in the various XML records are then interpreted by XSL stylesheets, which redistribute the information and generate local HTML files as their output. The local HTML is, in turn, styled using CSS and then uploaded to the web. The 68,000+ document summaries that comprise the meat of Linus Pauling Day-by-Day have been compiled by dozens of student assistants over the past ten years. Typically, each student has been assigned a small portion of the collection and is charged with summarizing, in two or three sentences, each document contained in their assigned area. These summaries have, to date, been written in a series of WordPerfect documents. 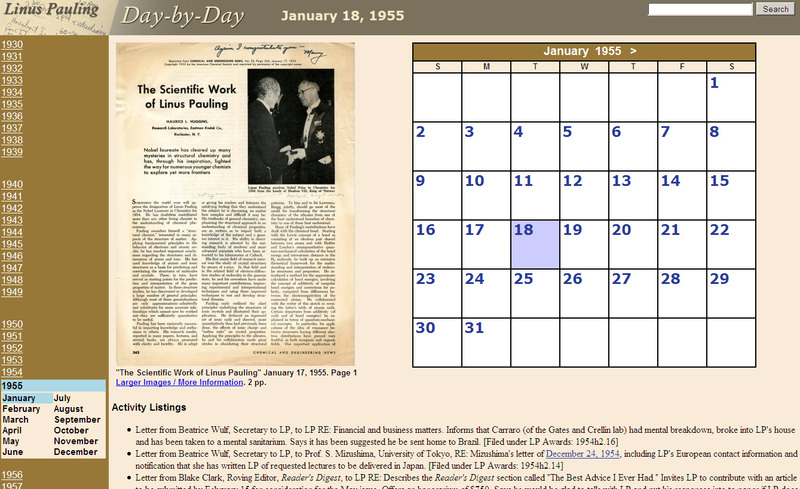 The January 30, 2009 launch of Linus Pauling Day-by-Day is being referred to, internally, as Calendar 1.5. This is in part because of several major workflow changes that we have on tap for future calendar work, a big part of it being a movement out of WordPerfect. While the word processing approach has worked pretty well for our students – it’s an interface with which they’re familiar, and includes all the usual advantages of a word processing application (spellchecking, etc.) – it does present fairly substantial complications for later stages of the work flow. For one, everything has to be exported out of the word processing documents and marked-up in XML by hand. For another, the movement out of a word processor and into xml often carries with it issues related to special characters, especially “&,” “smart quotes” and “em dash,” all of which can play havoc with certain xml applications. Our plan for Calendar 2.0 is to move out of a word processing interface for the initial data entry in favor of an XForms interface, but that’s fodder for a later post. Once a complete set of data has been compiled in WordPerfect, the content is then moved into XML. All of the event summaries that our students write are contained in what might be called “Year XML” records. 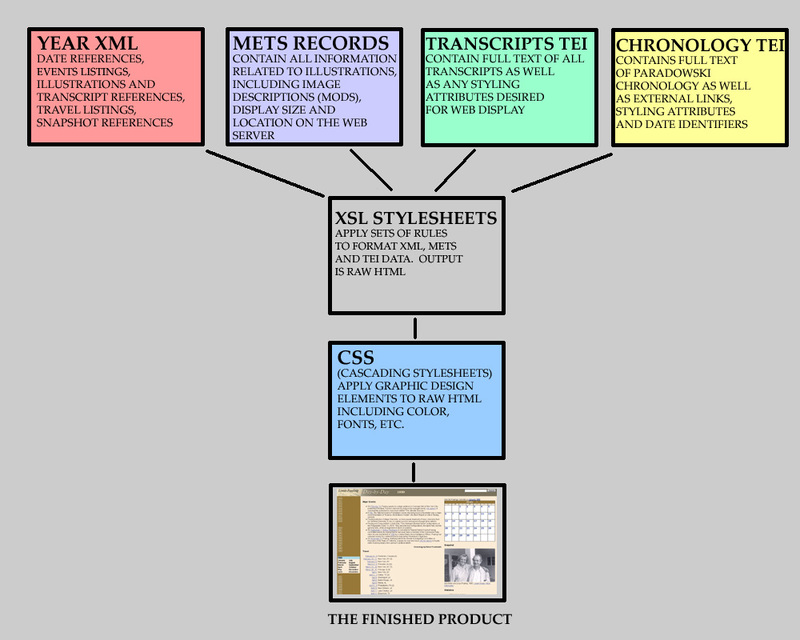 An example of the types of data that are contained in these XML files is illustrated here in fig. 2. Note that the information in the fig. 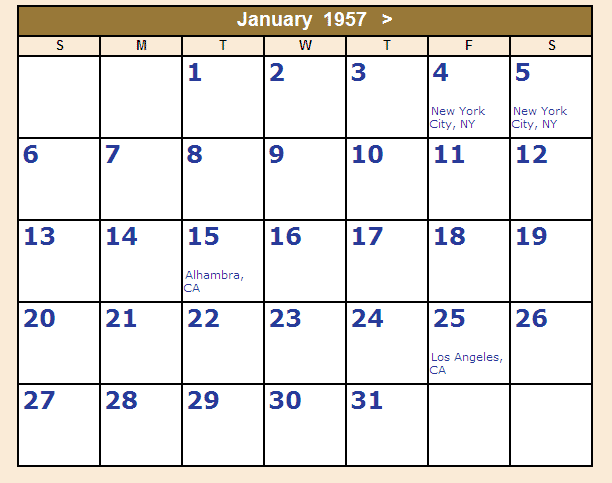 2 slide is truncated for display purposes – all of the “—-” markers represent text that has been removed for sake of scaling the illustration – but that generally speaking, the slide refers to the contents of the January 2, 1940 and August 7, 1940 Day-by-Day pages, the latter of which will also serve as our default illustrations reference. 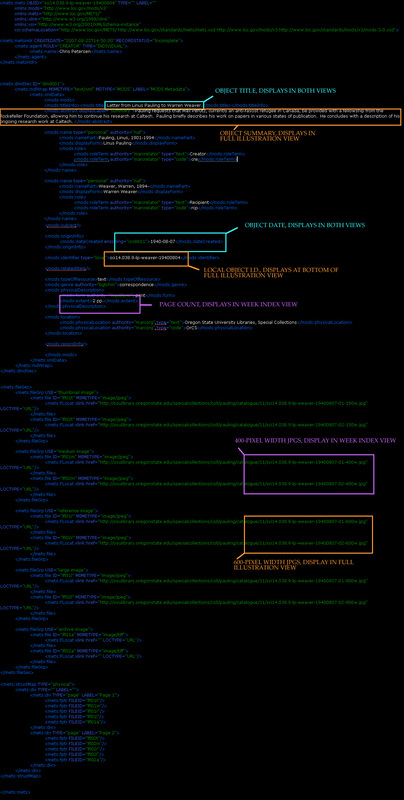 Cursory inspection of the “Year XML” slide reveals one of the mark-up language’s key strengths – it’s simplicity. For the most part, all of the tags used are easily-understandable to humans and the tag hierarchy that organizes the information follows a rather elementary logic. The type of record is identified using <calendar>, months are tagged as <month>, days are tagged as <day> and document summaries are tagged as <event>. The one semi-befuddling aspect of the “Year XML” syntax is the i.d. system used in reference to illustrations and transcripts. After much experimentation, we have developed an internal naming system that works pretty well in assigning unique identifiers to every item in the Pauling archive. The system is primarily based upon a document’s Pauling Catalogue series location and folder identifier, although since the Catalogue is not an item-level inventory (not completely, anyway) many items require further description in their identifier. In the most common case of letters, the further description includes identifying the correspondents and including a date. Fig. 2 provides an example of three identifiers. The first is <record><id series=”09″>1940i.38</id></record>, which is the “Snapshot” reference for the 1940 index page. This identifier is relatively simple as it defines a photograph contained in the Pauling Catalogue Photographs and Images series (series 09), the entirety of which is described on the item level. So this XML identifier utilizes only a series notation (“09”) and a Pauling Catalogue notation (1940i.38). The two other examples in Fig. 2 are both letters. The first is <record><id series=”01″>corr136.9-lp-giguere-19400102</id></record>, a letter from Linus Pauling to Paul Giguere located in the Pauling Catalogue Correspondence series (series 01) in folder 136.9, and used on Day-by-Day as the illustration for the first week of January, 1940. Because the folder is not further described on the item level, there exists a need for more explication in the identifier of this digital object. Hence the listing of the correspondents involved and the date on which the letter was written. The second example is a similar case: <record><id series=”11″>sci14.038.9-lp-weaver-19400807</id></record>, used as the Day-by-Day illustration for the first full week of August 1940. In this instance, however, the original document is held in Pauling Catalogue series 11, Science, and is a letter written by Pauling to Warren Weaver on August 7, 1940. We’ve talked about METS records a few times in the past, and have defined them as “all-in-one containers for digital objects.” The Pauling to Weaver illustration mentioned above is a good example of this crucial piece of functionality, in that it is used as a week illustration in the August 1940 component of the Day-by-Day project, and is also a supporting document on the “It’s in the Blood!” documentary history website. Despite its dual use, the original document was only ever scanned once and described once in METS and MODS. Once an item is properly encoded in a METS record, it becomes instantly available for repurposing throughout our web presence. Just about everything that we need to know about a scanned document is contained in its METS record. In the case of Day-by-Day, we can see how various components of the Pauling to Weaver METS record are extracted to display on two different pages of the project. Fig. 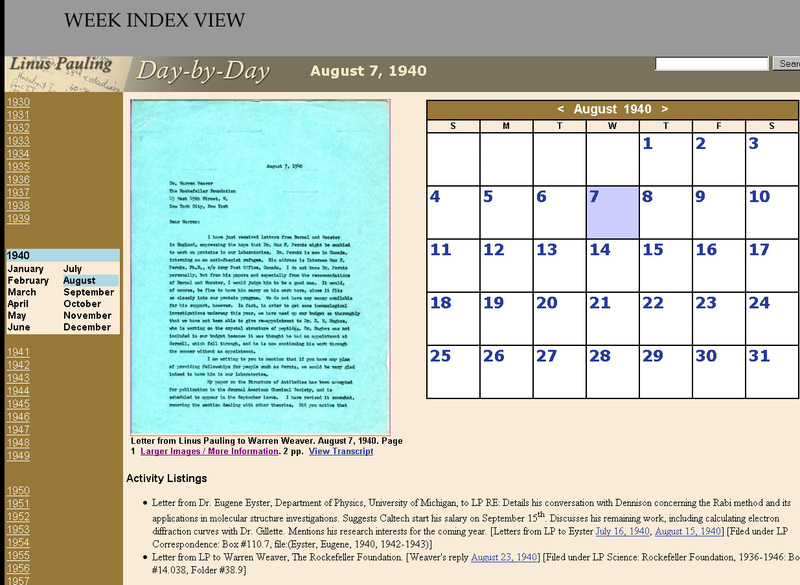 3 is a screenshot of this page, the “Week Index View” for the August 7, 1940 Day-by-Day page (all of the days for this given week will display the same illustration, but will obviously feature different events and transcripts listings). Fig. 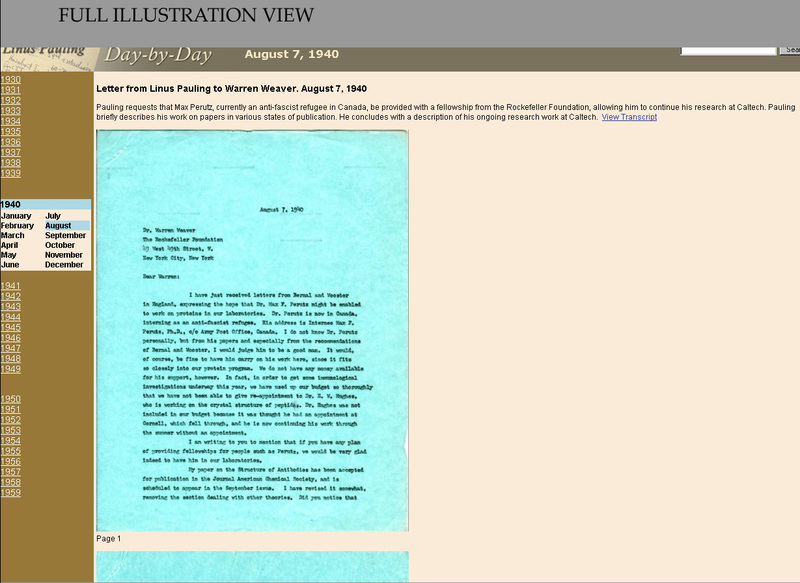 4 is a screenshot of the “Full Illustration View,” wherein the user has clicked on the Week Index illustration and gained access to both pages of the letter, as well as a more-detailed description of its contents. The Object Title, “Letter from Linus Pauling to Warren Weaver,” which displays in both views. 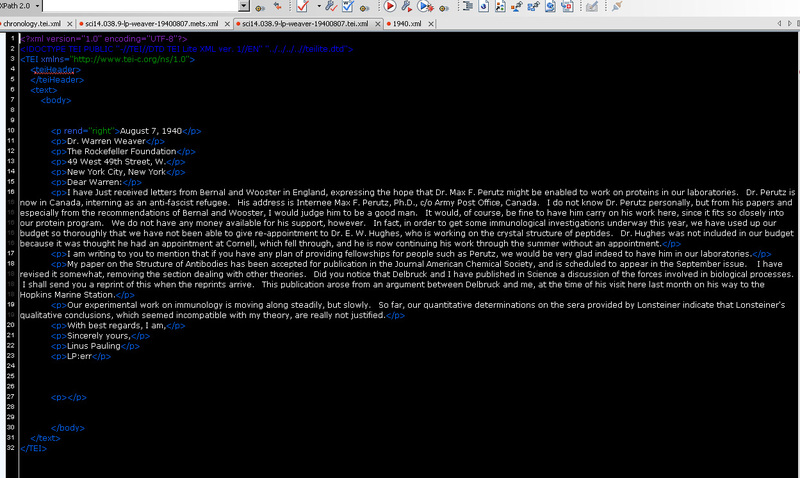 The Object Summary, “Pauling requests that Max Perutz…,” which displays only in the Full Illustration View. The Object Date, used in both views. The Local Object Identifier, sci14.038.9-lp-weaver-19400804, which displays at the bottom of the Full Illustration View. The Page Count, used only in the Week Index View. Crucially, the 400 pixel-width jpeg images, which are stored in one location on our web server (corresponding, again, with Pauling Catalogue series location), but in this example retrieved for display only in the Week Index View. And likewise, the 600 pixel-width jpeg images, which are retrieved for Day-by-Day display in the Full Illustration View, but also used for reference display in the Documentary History projects. In truth, the ten pages rule is somewhat arbitrary, but it works pretty well in coping with a major scaling problem that we face with the Day-by-Day project. Users will note that the “Full Illustration View” for all Day-by-Day objects presents the full page content (when available) on a single html page, as opposed to the cleaner interface used on our Documentary History sites. There’s a good reason for this. In the instance of the Documentary History interface, essentially two html pages are generated for every original page of a document used as an illustration: a reference view and a large view. This approach works well for the Documentary History application, in that even very large objects, such as Pauling’s 199-page long Berkeley Lectures manuscript, can be placed on the web without the size of a project exploding out of control – the Berkeley Lectures comprise 398 html pages, which is a lot, but still doable. Linus Pauling Day-by-Day, on the other hand, currently requires that the full complement of images theoretically comprising an illustration be used, specifically, for each unique day of the week for which an image is chosen. In other words, if the Berkeley Lectures were chosen to illustrate a week within the calendar, and the full content of the digital object were to be displayed for each day of that week using the same clean interface as a Documentary History, a sum total of 2,786 (199 x 2 x 7) html pages would need to be generated to accomplish the mission. For that week only. Obviously this is not a sustainable proposition. By contrast, the current version 1.5 approach always requires 7 html pages for each week, though full image support and super-clean display are sometimes sacrificed in the process. Calendar 2.0 will deal with the issue using a database approach, but again, this is a different topic for a different time. We’ve discussed TEI Lite in the past as well and will not spend a great deal of time with it here, except to reiterate that it is a simple mark-up language that works well in styling full-text transcripts and other similar documents for the web. The TEI Lite mark-up for the Pauling to Weaver letter is illustrated in fig. 6, as is, in fig. 7, the encoding for the biographical chronology (written by Dr. Robert Paradowski) used on the 1940 index page. Note, in particular, the use of <div> tags to declare a year’s worth of information in the Paradowski mark-up. These tags were included as markers for the xsl stylesheet to pull out a given chunk of data to be placed on a given year’s index page. The entire Paradowski chronology will be going online soon, and once again that project, as with Day-by-Day, will be generated from only this single record. fig. 6 The TEI Lite mark-up for Pauling's August 7, 1940 letter to Warren Weaver. Custom XML, METS records and TEI Lite – these are the building blocks of Linus Pauling Day-by-Day. Check back later this week when we’ll discuss the means by which the blocks are assembled into a finished website using XSL stylesheets. In 1999 we hatched the crazy idea of trying to document every day of Linus Pauling’s professional life. Researchers were, at the time, honing in on a draft of the human genome, and our thinking was, if scientists can map the exact genetic details of human existence, why can’t we map the daily activities of Linus Pauling? So began the project now known as Linus Pauling-Day-by-Day. Fast forward to this past Friday, and thirty years of the project have been completed. The Pauling Day-by-Day calendar now closely details Pauling’s every letter, manuscript, speech and travel itinerary for the years 1930–1959. It is plainly relentless in scope – in its current form, the site comprises over 23,000 static html pages and incorporates over 68,000 document summaries. Bits and pieces of Linus Pauling Day-by-Day have been released over the past several years, usually in conjunction with the launching of a new Pauling-related Documentary History website. This latest iteration of the calendar, however, marks the first time that the project has been presented as a cohesive whole. The launch also includes a number of important new features. 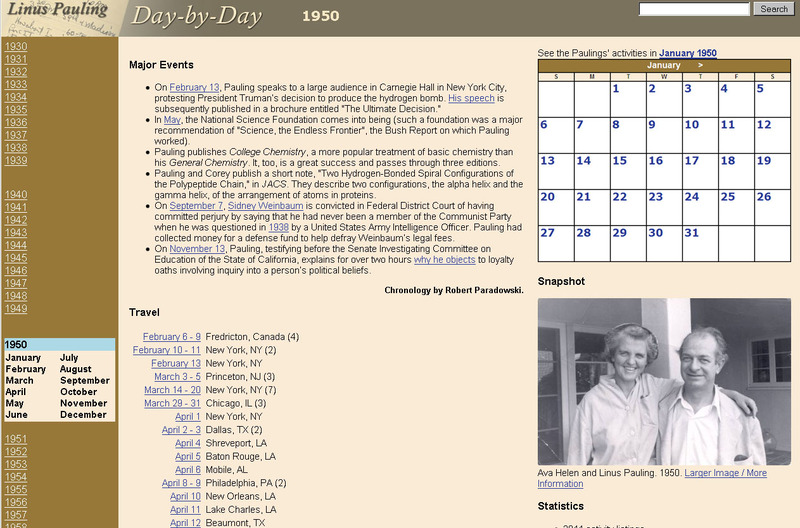 Pauling Day-by-Day now has a proper homepage and is key-word searchable (though, at the time of this writing, our search engine hasn’t quite completed indexing the site). Likewise, each year of the calendar has its own mini-homepage, featuring a full accounting of the Paulings’ travel for that year as well as an overview of the year’s activities as written by Pauling biographer Robert Paradowski. The navigation tools provided to move within and between years are also greatly improved. The Day-by-Day Index Page for 1950. Possibly the most significant new addition is the incorporation of almost 1,700 digital objects used to illustrate each week of Pauling’s activities; or, in the case of 1954, his first Nobel year, each day. In prior calendar releases, only the first page of each illustration was made available. Now, the entirety of virtually every document scanned into the calendar is accessible to the user – the illustrations have been transformed from pictures (by definition) to true digital objects. Pauling’s proposed research on gout; an idea on desalinating ocean water using atomic energy; a well-researched complaint about the water pressure in his home. A meeting with Albert Einstein; suspicions about the advertising claims being made by Canada Dry; quibbles with American Tourister about the design of his and Ava Helen’s new luggage. Got a broken bone? Consider gluing it back together. Interested in cute baby pictures? We have those too. Another exciting component of this version of Pauling Day-by-Day is our incorporation of a massive cache of full-text correspondence and manuscripts transcripts. Every 1930-1959 letter ever digitized by the OSU Libraries Special Collections is included, as are many of the letters written between Linus Pauling, Ava Helen Pauling and their children. In turn, we are able to follow the development of, for instance, the family’s shared obsession with cars. I am happy also that this occasion has brought me in touch with many old friends – with Paul Emmett and Joe Mayer and many others. Several of them said to me tonight that I appeared to be getting fat. This is not so. You know, when I was a boy in Oregon I used to go around a great deal in the green, damp Oregon woods, and I always came into contact with poison oak, which caused my face to swell and my eyes to swell shut, and me to apply so much lead acetate solution that it is a wonder that I didn’t die of lead poisoning. Yesterday I must have bumped into something similar, for my face began to swell, and I began to be afraid that I would have to speak here tonight with my eyes swollen shut – which I could have done, with the practice I have had speaking in the dark. After the ceremonies, Linus and Ava Helen are at the apartment of Alfred Mirsky, and Dr. Alfred Cohn, a professor at the Rockefeller Institute for Medical Research, learns of Pauling’s condition and asks to examine him. The next morning, Cohn and some other doctors, after performing various tests, diagnose glomerulonephritis, a renal disease characterized by the abrupt onset of facial edema and hypertension. They ask Pauling what he plans to do. Pauling replies that he intends to go to the Mayo Clinic where he is scheduled to give a memorial address. One of the doctors advises Pauling to cancel the speech and return to California, where he should get in touch with Dr. Thomas Addis in San Francisco, a specialist in the treatment of nephritis. On March 10, Linus and Ava Helen return to Pasadena. He arranges to see Addis, and, within a short time, Addis begins treating him. (He later tells Pauling that it was extremely fortunate that he did not go to the Mayo Clinic, because the doctors there would have pumped him full of a natural polysaccharide, and his edema would have disappeared, but he would have been dead in a little while.) Pauling is put on a low-protein diet and takes various vitamins and liver extracts. Interested readers are, naturally, able to follow the progression of Pauling’s return to health, a process documented by letters from Ava Helen to Dr. Addis as well as a full accounting of Linus’s meals during the early months of his combating the disease. Calendars retracing the daily activities of important figures were once a relatively popular component of the archival discipline. With time the sheer labor involved in compiling these types of resources rendered them impractical for most Archives and Special Collections. We, however, feel that Linus Pauling Day-by-Day is a worthwhile enterprise for at least a couple of reasons. For one, it gets used – the site has garnered well over 17 million pageviews since its first two years were released in 2003, and many of our reference requests are generated by content included in the project. Perhaps more importantly, we view the Pauling Papers, at 4,400 linear feet, to be more than a collection of Linus and Ava Helen Pauling’s prodigious work ethic. Indeed, the archive is so vast and multifaceted that, in a very real sense, it serves as a unique documentation of large swaths of twentieth-century scientific, political and cultural history. By describing so much of the collection on the item-level, researchers are now able to trace lines of inquiry that often have little to do, specifically, with the Paulings’ work. The successful release of a project of this size is clearly a testament to efficient technical processes. Check back with us next week when we’ll talk a bit more about how Linus Pauling Day-by-Day was created.